I basically lived off of peanut butter and jelly sandwiches for lunch when I was a kid. I did not like meat at all, so sandwiches with meat were out of the question. So, my Mom would make me good old PB and J. It was always with raspberry jam, and that ended up being my favorite. A close second was the strawberry jam PB and J sandwiches that my Dad made, because he always used strawberry jelly. When we would go on road trips in the Summer this was a staple meal for us, because it was easy to pack the ingredients and they wouldn't spoil without refrigeration. I would never turn down a good PB and J growing up. I mean, what's not to love about sweet jam and salty rich peanut butter. As an adult I still love the combination, even though I am not much for sandwiches. I like to use the flavors more in things like my overnight oats, or especially desserts. Peanut butter and jelly in cake is amazing. Just sayin'! 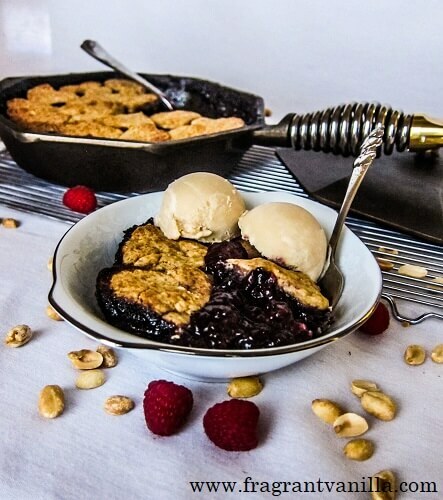 So, last weekend I made a delicious skillet cobbler with those flavors. Arousing Appetites, a company that sells all natural and sustainably sourced kitchen materials was kind enough to send me a beautiful Finex 10 inch cast iron skillet with a lid to test out. I was super excited when it arrived, and could not wait to make something in it! 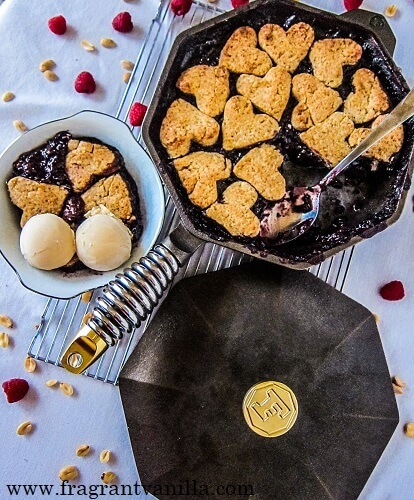 I was inspired to made a cobbler, because I have always wanted to make one in a skillet. 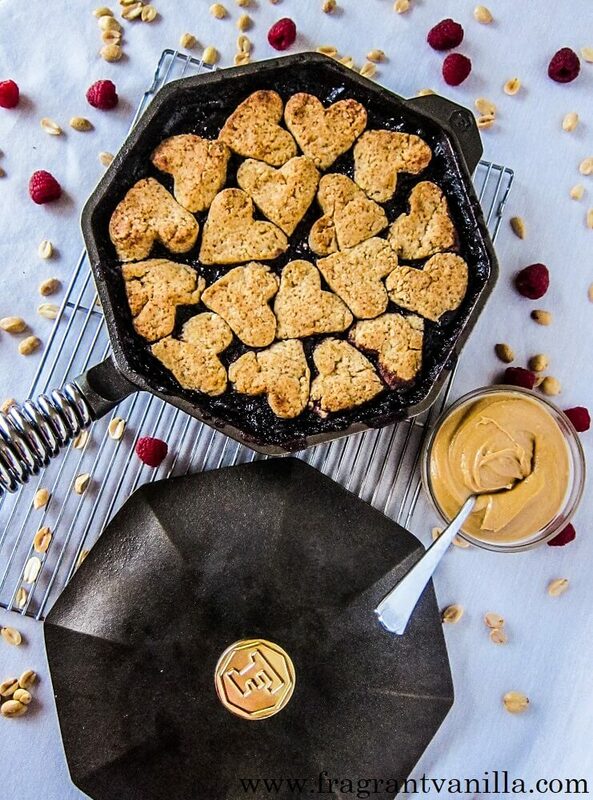 So how did I get the flavors of peanut butter and jelly into a cobbler? Well, first I cooked some organic berries on the stove in the skillet until they were good and jammy and added just a touch of maple syrup. They were so good, and it had taken about 30 minutes less time than if I had cooked them in the oven like I normally do. Next, I made some peanut butter biscuits to top it off with. I actually use a scone dough for these because it tastes like the most amazing flaky biscuits on a cobbler ever. I used both peanut meal (finely ground peanuts, similar to almond meal), and peanut butter in the biscuits to give them lots of peanut flavor. The dough even tasted amazing even before I baked them (and I would encourage you to try it). Yes, I like to sample things as I go along. Because that way, if I forgot an ingredient, or messed one up, I don't ruin my entire dessert. Because funny story, one time I accidentally used sea salt instead of granulated xylitol in my pie crust and it was a good thing I tasted it because that super salty crust tasted disgusting and if I had baked it my pie would have been ruined. I had to remake the crust but I didn't waste the fruit. Stuff like this doesn't happen often luckily but we all have off days once in a while where our mind is elsewhere. So yes, I make mistakes too, and you should never feel bad if you happen to make one. Anyways, back to that cobbler. I obviously didn't forget any ingredients in this because it turned out even better than I had imagined! After I placed the biscuits on it, I popped the skillet with the already hot cooked fruit in the oven and in 20 minutes it was beautiful! The biscuits had puffed up to flaky deliciousness and it smelled amazing. Once it was cool enough to try, I enjoyed some with some peanut butter ice cream I happened to have in the refrigerator. But you can use your favorite vegan ice cream. 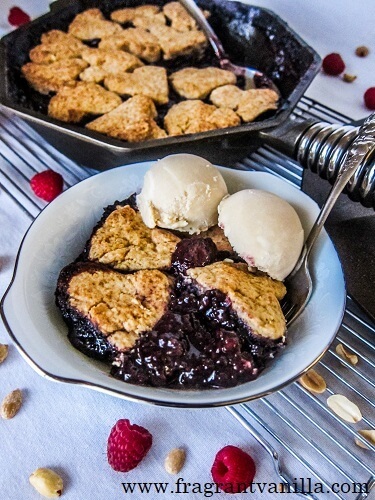 The peanut butter and jelly combination was fabulous in this cobbler! I encourage you to try it, and cooking it in the skillet was so much easier than just in a baking dish. If you would like one of these skillets for yourself, you can find them HERE. The pan is definitely crafted very well, and an investment that you will be able to keep for the rest of your life. I think a good cast iron skillet is essential to any serious cook's kitchen. Preheat oven to 400 degrees with the rack at the center position. To make biscuits, in a large bowl, combine the flour, peanut meal, sugar, baking powder, and salt. Cut in the oil with a pastry blender or 2 knives until the mixture starts to clump into pea sized pieces. In a small bowl, stir the vanilla extract and peanut butter into the coconut milk. Add the milk to the dough, and stir a few times, but do not over-mix. The dough should hold together when squeezed, but still be clumpy. Place dough on a floured work surface, and pat into a 1/2 inch tall rectangle. Cut small shapes out of the dough using a cookie cutter (or free form it), and set them on a parchment paper lined tray. Place in the refrigerator until the fruit is ready. To make the fruit, heat a 10 inch cast iron skillet over medium heat on the stove, and add the fruit and maple syrup to it. Cook until the fruit is bubbly, jammy and starting to fall apart, about 10-15 minutes. Add the lemon juice and zest, vanilla, flour to the fruit mixture and stir to until incorporated. Place the chilled biscuits on top of the cobbler. 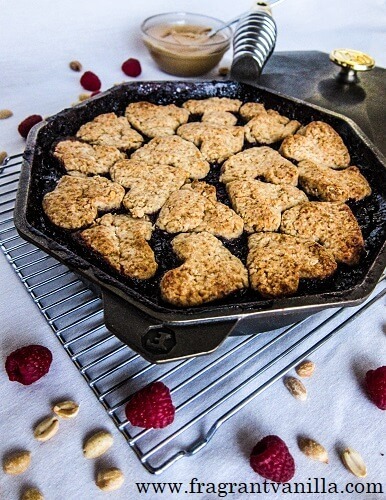 When all biscuits are on top of cobbler, sprinkle with coconut sugar and return to the oven. Bake for about 20 minutes until biscuits are cooked through and lightly brown and toasted on top (keep a close eye on they could burn very quickly). Remove from oven and let cool until warm, and top with some ice cream or coconut vanilla whipped cream and...enjoy!